Stamp My Feet offers a unique and fun way to capture and display your child's footprint or handprint. The best part is if you make a mistake you can wipe it off and redo it, big or small. The product is a 11" x 14" printed gallery wrapped canvas, which comes ready to hang with decorative ribbon. The do-it-yourself kit includes all the accessories necessary to create a treasured keepsake. The kit includes a black Made in USA, non-toxic stamp pad to ink the child's foot or hand. Also included are full upper case alphabet stamps and 0-9 number stamps for personalizing the child's name and (birth)date. These are clear rubber stamps which are perfect for this product because you can see exactly where to place each letter, practically mistake proof. If the user makes a mistake while doing the print, they can simply wipe the entire print off with a wet cloth (or small smudge off with a Q-tip) and redo it, yet it still dries to the touch. There are five designs offered in stock now which include pink bubbles, pink vines, ivory vines, green with khaki dots and blue and steel grey chevron print. 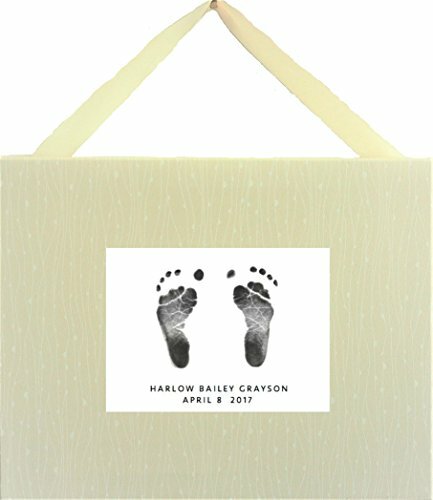 Stamp My Feet Baby Hand and Footprint Kit is a terrific gift for a Baby Shower, New Parents, Grandparents and a beautiful personal touch to any nursery. Display your child foot and hand print with a litle bit of art and sole. A-Z plus 0-9 stamps for personalizing your baby's name, age and weght. If you have any questions about this product by Stamp My Feet, contact us by completing and submitting the form below. If you are looking for a specif part number, please include it with your message.